Expect a glorious tweak fest of epic proportions by these two stars of the German electronic music scene. Lehn is a master of ancient analog synthesizers, especially the little VCS3 suitcase model that Eno used to mangle Roxy Music. Wielding patch cables and twiddling knobs like a wildman, he puts these screen-gazer laptop kids to shame – how many guys have you ever seen work up a sweat playing a synthesizer? But computer whiz Schmickler holds his own, proving that analog and digital can play nice together after all. While they both share roots in contemporary classical, Lehn is mostly known as a free improviser while Schmickler is famous in the dance music scene. Somehow they manage to work it all out. Since the early 1980s Thomas Lehn has been working as a performer, interpreter, composer and improviser of contemporary music. Based on his background as an interpreting and improvising pianist in classical, contemporary composition and jazz, he has developed an individual language in live electronic music using analog synthesizers of the late 1960s. 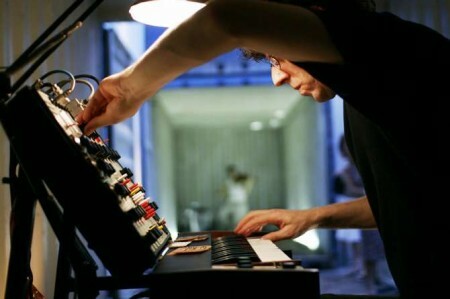 The facility of these instruments to modify electronic sounds very directly, as well as to combine and to control several parameters at the same time, allows him to spontaneously act and react in close contact with the process of tension, space and structure of the music during its performance. In addition to his duo with Marcus Schmickler, he performs and records with several ongoing groups, including Konk Pack (with Tim Hodgkinson and Roger Turner); Toot (with Phil Minton and Axel Doerner); Vario 34, a sextet with Guenter Christmann, Alexander Frangenheim, Mats Gustafsson, Paul Lovens and Christian Munthe; Glassband, a quintet with Phil Wachsmann, Evan Parker, Alexander Frangenheim and Roger Turner; and the Music in Movement Electronic Orchestra (MIMEO), which includes 12 representatives of contemporary electronic music from 7 European nations. He also maintains active duos with Gerry Hemmingway, Eugene Chadbourne, and Guenter Christmann. He has released CDs on many labels, including Erstwhile, Edition Explico, Grob, Fringes, Hybrid, and others. His solo CD “Feldstaerken” is available from on the German label Random Acoustics. As a member of the Cologne-based a-Musik collective, Marcus Schmickler has helmed a dizzying array of musical projects such as Pluramon and Pol, recorded several albums worth of experimental electronic music, and produced acid house tracks for Thomas Brinkmann’s Max label. In his spare time, he has honed his improvisational skills through various tete-a-tete encounters, as well as participation in groups such as MIMEO and Kontakta. He first came to prominence for “Wabi Sabi” (1996), an avant garde work of computer-generated drones that updated Lou Reed’s “Metal Machine Music” to the digital age. As Pluramon he released “Pickup Canyon” (1996), a collaboration with Can’s drummer Jaki Leibezeit. In 2003 he collaborated with David Lynch chanteuse Julee Cruise on “Dreams Top Rock”. His most recent works in contemporary electronic- and/or ‘mechanical’-music file under such names as Sator Rotas, Render Bandits, or his most recent neoclassical orchestral and electroacoustic work “Param” (2001). His interest for different fields of musical understanding finds a way into projects like Corvette, and collaborations as performer and producer with or for a heterogenous range of musicians from Georg Odijk, Jan Werner, Keith Rowe, Oswald Wiener (Selten gehörte Musik) and Thomas Brinkmann, to David Behrman, Karlheinz Stockhausen, Julee Cruise and Stephen Galloway. His work has been released on many labels, including Mille Plateaux, a-Musik, Karaoke Kalk, etc.